DIY Elements are purchased in the straight length and bent to suit the appliance on site. Each DIY range are suitable for either WET (W) or DRY (D) applications. The DIY range comes complete with 1/2″ long 3/8″BSP (Aprox. 16mm) diameter brass glands, fibre washers and brass back nuts. Both ends of the elements are fitted with 4mm screw and washer terminations. Do not bend the elements in cold zones. (Area aprox.75mm from glands) If you require tight end bends on your element, let us know we may be able to bend to your specifications. Once the element is bent, do not try to straighten the element, as this may fracture the sheath. The standard DIY range varies from aprox. 700mm in length to 3200mm. If you require a straight heating element that is either shorter or longer than those specified on this site, please contact us. DIY10D is a 1000W 240V 1020mm Bendable Heating Element with 3/8″BSP glands for dry applications. All elements come with fibre gaskets and back nuts with a screw and washer termination. DIY10W 1000W 240V 920mm Bendable Heating Element with 3/8″BSP glands for wet applications. All elements come with fibre gaskets and back nuts with a screw and washer termination. 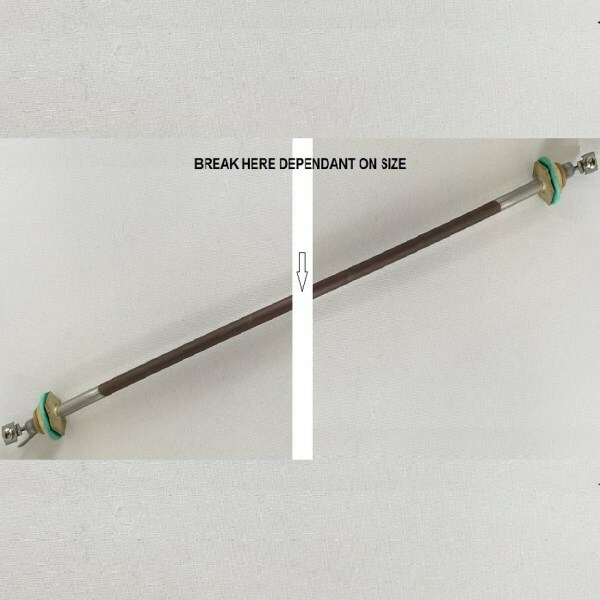 DIY12D is a 1200W 240V 1420mm Bendable Heating Element with 3/8″BSP glands for dry applications. All elements come with fibre gaskets and back nuts with a screw and washer termination. DIY12W 1200W 240V 1120mm Bendable Heating Element with 3/8″BSP glands for wet applications. All elements come with fibre gaskets and back nuts with a screw and washer termination. DIY15D is a 1500W 240V 1930mm Bendable Heating Element with 3/8″BSP glands for dry applications. All elements come with fibre gaskets and back nuts with a screw and washer termination. DIY15W 1500W 240V 1320mm Bendable Heating Element with 3/8″BSP glands for wet applications. All elements come with fibre gaskets and back nuts with a screw and washer termination. DIY18D is a 1800W 240V 2180mm Bendable Heating Element with 3/8″BSP glands for dry applications. All elements come with fibre gaskets and back nuts with a screw and washer termination. DIY18W 1800W 240V 1708mm Bendable Heating Element with 3/8″BSP glands for wet applications. All elements come with fibre gaskets and back nuts with a screw and washer termination. DIY20D is a 2000W 240V 2490mm Bendable Heating Element with 3/8″BSP glands for dry applications. All elements come with fibre gaskets and back nuts with a screw and washer termination. DIY20W 2000W 240V 1830mm Bendable Heating Element with 3/8″BSP glands for wet applications. All elements come with fibre gaskets and back nuts with a screw and washer termination. DIY20D is a 2000W 240V 2890mm Bendable Heating Element with 3/8″BSP glands for dry applications. All elements come with fibre gaskets and back nuts with a screw and washer termination. DIY24W 2400W 240V 2340mm Bendable Heating Element with 3/8″BSP glands for wet applications. All elements come with fibre gaskets and back nuts with a screw and washer termination. DIY6D is a 600W 240V 720mm Bendable Heating Element with 3/8″BSP glands for dry applications. All elements come with fibre gaskets and back nuts with a screw and washer termination. DIY7D is a 750W 240V 1000mm Bendable Heating Element with 3/8″BSP glands for dry applications. All elements come with fibre gaskets and back nuts with a screw and washer termination. DIY7W is a 600W 240V 710mm Bendable Heating Element with 3/8″BSP glands for wet applications. All elements come with fibre gaskets and back nuts with a screw and washer termination.